Naruto seems to be the new Yu-Gi-Oh! when it comes to popular children\'s cartoons. If you have family or friends under the age of thirteen, it\'s likely you\'ve been exposed or will be shortly to the ninja-centered anime series. 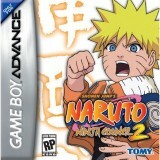 One of the several Naruto video games recently released is Naruto: Ninja Council 2. The game follows a selection of the Naruto storyline from the actual series. Main characters Naruto, Sasuke, and Sakura go through the trials of several ninja exercises and exams while dealing with a villainous man named Orochimaru. Orochimaru has some sort of bone to pick with Sasuke, but of course he and his friends won\'t cooperate with his plans. Naruto has the feel of a side-scrolling adventure game with a fighting game-style boss at the end of each level. Each level of the game reveals a shred of story, then sends the three characters out on an adventure fighting enemy ninjas and maneuvering over the terrain using special techniques and fighting abilities, then puts them up against a major enemy at the end of the level. Players will have the chance to select their favorite character of the three during each level, but they\'ll also be able to switch them mid-level should they find the need to. Each character has slightly different stats, however I really didn\'t notice the difference between characters. The one thing that is different between characters are the special attacks that each one possesses. These moves deal more damage than a normal volley of punches and kicks. I expected moves like this to be limited, but the player can perform them as many times as they see the need to, provided they have enough health to do so. Moves that are limited come in the form of scrolls that can be collected throughout the game. The characters can use them to call an ally in to perform a special attack. And above all, if all three characters die, it\'s automatic game over. Though Naruto sounds involved, it\'s really not. The seasoned gamer will plow through the levels in no time at all. The only real difficulty here occurs during boss battles. Once the fighting patterns have been identified, it\'s no contest. Saying that, you\'ll probably get at a day\'s worth of enjoyment out of this title at most. However, if you\'re twelve years old...yeah, it\'s probably challenging. Naruto\'s plot may be a little confusing to those not already familiar with the anime series, since it seemingly draws storylines from the show. Another turn-off is the music, which can be extremely grating on the ears at times. Secrets are boasted in the game manual, but they don\'t amount to much in the end. Naruto does get a good grade when it comes to graphics, but that simply isn\'t enough to save it. Do you want my opinion? If you\'re that curious about this title, give it a play. Then immediately distribute it to your little brother or cousin and be done with it. Even if you\'re a diehard Naruto fanatic, you can pass this one up without feeling guilty, because you\'re not going to be missing much.